Meet three-year-0ld Zakariyah. As a result of a traumatic brain injury (TBI) that he endured as a baby, Zakariyah has been diagnosed with seizure disorder, vision impairment, and spastic quadraparesis. Because of his diagnosis he experiences decreased strength, decreased range of motion, and decreased functional mobility. Although faced with these difficult challenges, Zakariyah finds joy in his life every day. 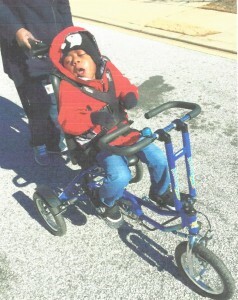 Zakariyah received an adaptive tricycle!! The trike will provide prevention of contracted muscles and orthopedic abnormalities. This device will promote upright posture, bone growth, strengthening of muscles, and better hand-eye coordination.